October saw me get out of the city twice for little adventures. On the first weekend I took the train down to Geelong to catch up with family friends and watch the AFL Grand Final. Unfortunately the game was a little lacklustre as Hawthorn won for the third year in a row. The next day we took their dogs for a walk on the beach in Torquay, which was so beautiful. I literally just dipped my feet in the water and it was numbingly cold. Welcome to Victoria, I guess. That night was my grand final of choice, for NRL. In a game that saw me jump around my living area screaming like a five year-old girl, my team (the North Queensland Cowboys) won the premiership. It was the first time in 20 years and I still can’t get over it. I am so proud of my team. The following weekend my Aussie partner-in-crime-in-Canada, Kate (who I went on many adventures with) visited from Sydney. We did a Great Ocean Road day trip, which lives up to its hype. We ate, a lot, at different places in Fitzroy, Richmond and St Kilda. We watched Kisschasy’s break-up performance too (I’ll miss them). All in all a perfect weekend in Melbourne. Next up I checked out North Melbourne for the first time and decided to start my Melbourne Suburb Spotlight section on the blog. Other than that, I have been working at both jobs, losing important house keys (#halesfails) and trying to find some freelance writing work. I have also watched too much TV. It’s seriously an addiction. Hipmunk Collaborations: I collaborated on two posts for Hipmunk this month. Firstly, where to stay in Fort Meyers Beach, Florida. Plus a look at the coolest European hangouts. A Day in Melbourne’s City: My first post featuring photos I edited on Lightroom (I am such a nerd but damn that program is awesome). I give a rundown on the best things to see and do in Melbourne’s CBD. 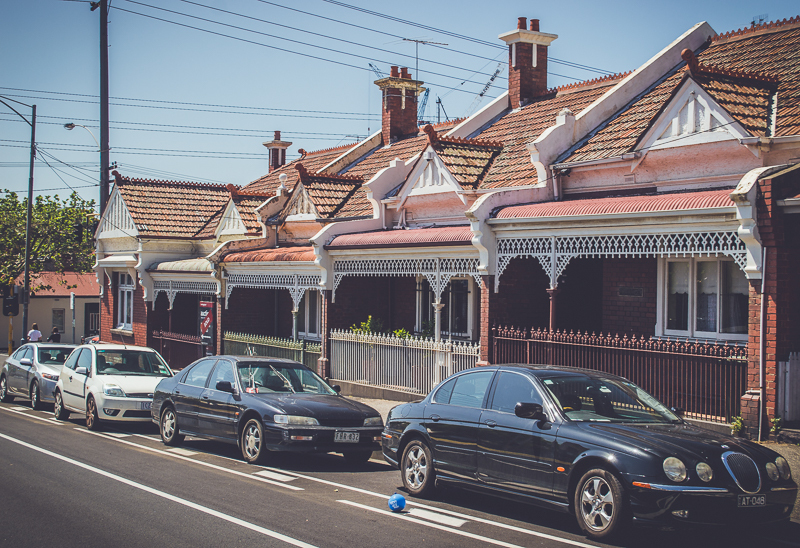 North Melbourne: The initial post in my new category, focusing on guides to different Melbourne suburbs. I hope these help other visitors and locals get the most out of this city. I ticked a few books off this month, but I have plenty to go to complete this challenge in two months! Wish me luck. What a mammoth read. It felt like an accomplishment just getting to the end of this read. It is a very interesting historical fiction book though, which has since been turned into a TV series. It is about Claire, who gets transported to Scotland.. 18th century Scotland. Outlander is long but completely action-packed and thoroughly entertaining. I am glad I got to finish this series through categories in the challenge. The Selection series is a very easy to read young adult compilation. It is set in futuristic America, about a prince who must select his future wife. If you need an escape, look no further. Look, I’m a nerd, I read every book in school that I had to. So for this challenge I chose another young adult novel to fill the void. John Green is a fantastic and realistic writer. I really enjoyed this novel about a soon-to-be high school graduate who is searching for his friend (and crush), through clues. It all comes back to a paper town. Over the past few months I have been watching the entire Bones series, so it was natural I chose a book based on the series. Bare Bones focuses on Dr Temperance Brennan and three different but connected murder cases she is solving. The novel was great and reminded me of Janet Evanovich’s Stephanie Plum series. I loved this guide to Spring Racing Fashion by Sonia Styling, which will definitely come in handy. I thought this Pinterest for Bloggers post by Leah from The Mochilera Diaries was really informative, and I hope to use some of her tips in the near future to increase my Pinterest presence. These Photos from Queensland by The Wanderbug make me homesick. But damn I grew up in a pretty state, right? Although I won’t be going to New York City any time soon, this list of the Best Places in Williamsburg is very well researched by Christine from C’est Christine. I have started watching Scorpion, which is inspired by the life of Walter O’Brien. It is an entertaining show and the characters are very likeable. Other shows I am currently enjoying? Chicago PD for a little bit of cops and robbers action. Jane the Virgin for laughs (if you don’t watch this show, you are seriously missing out). Plus I finally caught up on The Good Wife and I am still enjoying this legal drama. Although I haven’t written anything new this month, my post on Easey’s Burgers for Feast Melbourne was featured in GRAM Magazine, which is distributed across Melbourne. That was cool. This wee blog also got featured here as one of the top 25 budget travel bloggers. November sees me going to the races and hopefully doing a bit of eating for Feast Melbourne. My parents are also coming down to visit at the end of the month, so I hope Melbourne shows off and the sun shines during their time with me. I can’t wait to show them my favourite places and we will hopefully check off a new suburb for another guide. What was your October highlight? Please share in the comments below.